Building raincoats, underground delivery systems and dynamic pavement may all soon be a reality in the waterfront neighborhood of Quayside. Since Toronto officials announced Sidewalk Labs as its official partner for a "digital city" venture in October 2017, teams at the Alphabet-led company and Waterfront Toronto have joined creative forces to conceptualize an aesthetically appealing and efficient, people-first community: Quayside. ​At a roundtable discussion on Aug. 14-15, leaders from both organizations — a collaborative entity known as "Sidewalk Toronto" — took the stage to give stakeholders and glimpse at the proposed design concepts that Quayside could encompass once it's completed. 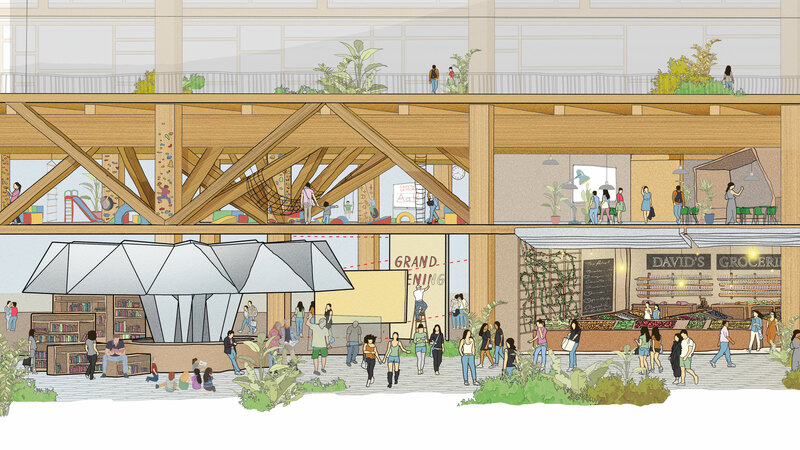 Jesse Shapins, director of Public Realm at Sidewalk Labs, explained it as designing a "living room, not a formal room," which is evident in its renderings. The Sidewalk Toronto team has a long way to go before Quayside is a reality. "This work is really complicated," said Aaron Barter, an urban planner at Sidewalk Labs. Yet the Master Innovation and Development Plan (MIDP) is slated for completion in less than a year, and so far, it's shaping up as an impressive project. Below are five of the most innovative and striking design features that may find a home in the futuristic, waterfront neighborhood of Quayside. The teams at Sidewalk Labs and Waterfront Toronto believe that the amount of time the public spends outdoors can be doubled if systems are put in place to increase comfortability. One concept researchers have been exploring is a building "raincoat" made of a translucent material that can be attached to a building and appear or disappear based on real-time weather. "Instead of building another underground path, could we actually bring the public life up to the street, connect people more easily in those spaces, create something as comfortable but really outdoors," Shapins said. Karim Khalifa, director of Buildings Innovation at Sidewalk Labs, echoed these thoughts. "It's a place where you may unzip your coat but you wouldn't take it off — but you'd be comfortable because there's no wind." The growth of e-commerce has increased supply chain operations around the world, making delivery vehicles a frequent occupant of valuable curb space. Yet, in a development like Quayside where streets will be prioritized for people and not UPS trucks, developers are looking to redesign freight operations. "We start to imagine that we can have freight coming underground, or even at ground but in through the building, at some back channel. But how do we get freight to go vertically?" asked Khalifa. He said architects and developers at Quayside are determining the best way to get freight traffic off of its streets, while some researchers are examining how robotics can travel up and down in buildings to get packages to places that are controlled and convenient. Streets are often at the center of public life, which is why Sidewalk Labs has teamed up with design firm Carlo Ratti Associati (CRA) to develop a prototype for a modular, reconfigurable pavement system "We don't ever talk about it, it's around us all the time, but it's possibly one of the most important part of our lives," said Shapins of pavement. "What would it mean to make [pavement] more for people?" Shapins explained that in Quayside, "pavement for people" would possibly entail removing the curb to put everything on an equal level. The pavement can include heating to help the city deal with snow or ice in the winter — making walking or cycling easier — and can also incorporate lights to make it possible for lanes and designations to change throughout the day. The concept of modularity also benefits the city in terms of repairs. "You no longer need a big process to go in and tear up your street to fix something," Shapins said. As cities around the world push their residents to be less car dependent, parking garages are becoming vacant plots of concrete that are difficult and costly to reconstruct into usable land. "What happens one day ... if we don't have as much need for parking?" Khalifa asked, implying that shared mobility systems or autonomous vehicles may be preferred travel methods in the next few decades, as opposed to car ownership. To ensure sustainability in development, Sidewalk Labs is researching a centralized parking system that would be built to eventually be transformed into a different use case in the future. Developers will likely place elevators and other amenities in the core of the parking system, allowing it to be turned into a more traditional residential building if there is a decline in parking demand. 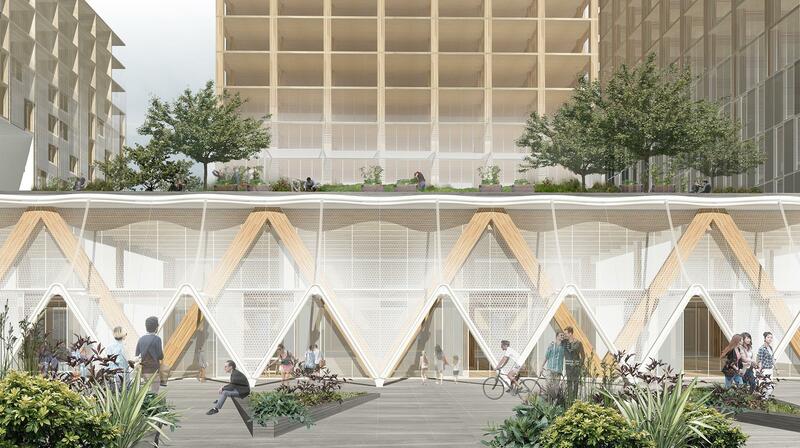 Continuing in the theme of sustainability, Sidewalk Labs and Waterfront Toronto envisions Quayside's buildings to be adaptable and modular for ever-changing residential and business needs. The teams have explored a concept called "stoa," a Greek word that promotes diverse usage of a ground floor space, given that the space is designed to evolve and adapt. Shapins said this concept can come to life with moveable walls, fast floor installations and flexible wall panels that "allow the community to constantly evolve it themselves." Khalifa sees such panelized systems as a way for Quayside to grow and shrink spaces over time. This can be beneficial for families that are expanding — or, alternatively, families that get smaller as their children grow up and move out — or for businesses that grow or consolidate. These adaptable buildings will include green roofs and sustainable systems, facade glazing to control solar heat and energy efficiency, and smart sprinkler systems to make fire management more efficient. Khalifa also noted many of these structures can be built primarily — or even entirely — out of timber. He says mass timber is a native resource of Canada, it promotes a healthier living space and it can be partially assembled offsite to speed up construction time. "Mass timber at Quayside can enable a unique living experience on the waterfront, expand housing options for a diverse range of residents, and we think really this is a wonderful opportunity for Canada to grow an industry [and] become a center of excellence for the world," said Khalifa.